Emulsion removers or stencil removers are chemicals that dissolve emulsion or capillary film in order to aid their removal. They are used to reclaim screens for later reuse. BIOBlend-B is a universal ink degradent that is drain safe and works on all types of inks. When used as a first step in screen relcaiming, BIOBlend-B reduces mesh staining and can diminish the need for haze remover. BIOHaze is a low caustic liquid haze remover that completely removes ink and diazo stains. Treated screens look like new mesh. BIOStrip #2 is a fast acting emulsion remover concentrate that can be diluted up to 1:55. Chroma/Stain Remover 560 Red reduces or eliminates ink residue or haze in mesh. It contains degreasers, leaving the screen degreased and ready for reuse. ChromaStencil Remover 100 is a 100% crystal product for the removal of emulsions. This solution has no flash point and has a low toxicity. ChromaStencil Remover 100 is compact, easily stored, and can be mixed as needed. ChromaStencil Remover 285 is a super concentrated liquid product formulated for the removal of all photosensitized emulsions. It is especially suitable for automatic systems. ChromaStencil is considered corrosive and quickly dissolves photosensitized emulsions and rinses away completely. ChromaStrip is designed for use with direct emulsions, capillary films, and direct/indirect films. It contains an oxidizer and other agents that enhance efficiency and remove residual ink films. FOTECHEM 2040 is a concentrated liquid stencil remover designed to work on all emulsions and capillary films. It can be diluted up to 1:25 with water. FOTECHEM 2040 can be used for manual and automatic reclaiming and will not crystallize and block spray nozzles. FOTECHEM 2040 is economical and versatile, and can be mixed at a 1:10 ratio for manual spray use, up to 1:25 for automatic application, or diluted up to 1:40 for use in a dip tank. FOTECHEM 2086 is a haze remover gel that removes old stains and ghost images from used screens. It is a powerful and fast-acting formula that works in minutes. The convenient gel form allows for easy application. 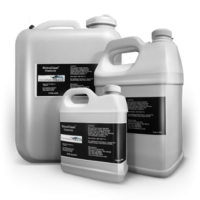 AP 1000 is a high performance all purpose water-soluble screen wash and emulsion remover designed to work quickly on plastisol inks. It is ideal for efficient and expedient screen washing and reclaiming after the press run. AP 200 is a water-soluble screen wash/emulsion remover. It is ideal for efficient and expedient screen washing and reclaiming after the press run. AP 300 is a water-soluble screen wash designed to work quickly. It is ideal for efficient and expedient screen washing and reclaiming after the press run. ER 8500L is a highly concentrated, easy-to-dissolve emulsion reclaiming concentrate in liquid form. It is designed for quick and convenient removal of emulsions and capillary films from screens. ER 8500P is an emulsion reclaiming concentrate in powered form, designed for quick and convenient removal. It removes emulsions and capillary films from screens. It is also easy to dissolve contents into water to make reclaiming solutions and allows for no separation of active ingredients. ER 8550L is a highly efficient, ready to use, emulsion reclaiming solution. It is designed for quick and convenient removal of emulsions and capillary films from screens. ER 9500L is a highly concentrated, easy to dissolve emulsion reclaiming concentrate. It is designed for quick and convenient removal of emulsions and capillary films from screens. ER 9900L is a highly concentrated, easy to dissolve emulsion reclaiming concentrate in liquid form. It is designed for quick and convenient removal of emulsions and capillary films from screens. HR 2400 is a liquid haze/ghost image remover specially formulated to remove embedded UV, conventional and plastisol inks that remain on the screen following emulsion removal. It effectively lifts the haze and embedded ink from the mesh, then emulsifies and dissolves the ink resins, binders, pigments, plasticizers, etc. The solution suspends resins so reattachment to the mesh surface is prohibited, thus allowing for water-rinse removal. It also removes dirt and other residue. HR 2800 is a thick liquid haze/ghost image remover specially formulated to remove embedded UV, conventional and plastisol inks that remain on the screen following emulsion removal. It effectively lifts the haze and embedded ink from the mesh, then emulsifies and dissolves the ink resins, binders, pigments, plasticizers, etc. The solution suspends these constituents so reattachment to the mesh surface is prohibited, thus allowing for water-rinse removal. It also removes dirt and other residue.